Warren Buffett is a seriously rich self-made man, with great social values. He’s one of the largest philanthropists in the world, and has enough control over his ego to let someone else—Bill Gates—manage his philanthropy. You might think that even I wouldn’t have the nerve to criticize Warren Buffet. For anything. 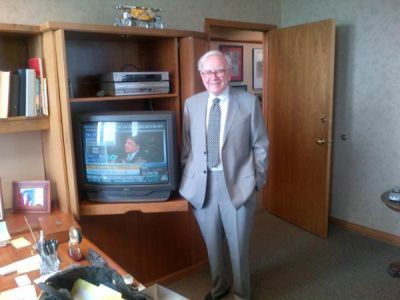 Why is Warren Buffett still using a television he bought in . . . oh . . . I’m guessing 1990? If I had a chance to pose Mr. Buffett that question I presume The Wizard of Omaha’s answer would be that the television he’s using is good enough. And sometimes good enough is good enough. He’s been quoted, for example, saying that he doesn’t bother buying new things unless they make him money, and really, how would a new television make Warren Buffet money? Here’s where that “good enough” thing comes into play. Last year, I bought one of my sons a high definition television as a gift. He was less than gracious, telling me that the old TV he already had was good enough. I was incredulous, not only at what I perceived as an insult but at the idea that a 19 ” tube television could be thought of as a match for a 32 ” flat-panel. All it takes is one look at almost any sporting event to know—truly feel—how much better high definition TV is compared to the older kind. Even when you’re just looking at . . . say . . . Warren Buffett’s programming of choice, CNBC, high-definition TV is easier on the eyes than older televisions. And I’m not using “easy on the eyes” to denote “pretty”. Literally, high-def is easier on the eyes. I can’t say that easy on the eyes will make Warren Buffet more money today, but I’m certain that it will help him in a real way, sooner or later. Easy on the eyes is better. Now sure, Mr. Buffet might need new furniture to accommodate that bigger TV, but he can afford it, and as I said, the change will help him. For real. I’m certain of it. So what’s the real reason Warren Buffett is still watching that old TV? Even Warren Buffett gets stuck in repeating loops, and while it’s impossible to argue with Buffett’s success, we can apply the lesson to the way the rest of us move through space and work on business change. And changing things like this is easy, right? So on to that point about which browser Warren Buffet uses. While I expect that the Chairman of Berkshire Hathaway does look at a computer screen from time to time, he doesn’t spend much time just mousing around. I also suspect that he doesn’t think about what browser he’s using, although given his friendship with Bill Gates, Buffett would probably lean toward Internet Explorer if the subject ever came up. But for the rest of us, inertia isn’t the way to go. As this test shows, there’s at least one compelling reason to use Internet Explorer on Windows-based, battery-powered computers. IE is better on battery life. This probably has nothing to do with Microsoft’s foray into new battery technologies; they’re just better at tweaking Windows than anyone else. And of course, they should be. But it raises other questions. Does Microsoft having done a better job making Internet Explorer conserve battery power mean that all Windows users who takes their computers with them should use it? In a sense, sure. But the second part of that study shows that Internet Explorer is also the slowest browser, by a significant margin. I like my speed, thank you. And that doesn’t even account for the fact that as a Google Chrome user—and one not afraid of the Google privacy kerfuffle—I have all of my bookmarks, browser history, and other environmental goodies with me on all my computers. Internet Explorer doesn’t yet make that possible. On the other, other hand, I can relate to wanting to get the most battery life from my laptop, which is why I accept the trade-off of carrying an Acer Netbook (low “power”, small screen, but eight hours of battery life) instead of my “real laptop”, a Dell power monster that gets just over two hours on a charge. So I look at my options, I find a formula that works, and I create business change starting from there. A long time ago, Intuit released an upgrade to Quicken that was rendered unusable by its insistence on grabbing all available computer resources and doling them out; trying to use that version of Quicken meant you were all but dedicating your computer to that one program. It was unconscionable, either because Intuit was doing a land grab on purpose or because they had done careless programming. And despite Google knowing better and having the resources not to make this kind of mistake I suspect that the bad things about Chrome are related to either or both of those issues, too. Somehow, somewhere, even as they slide toward irrelevancy, Microsoft seems to be getting parts of their act together. Sometimes, business change happens in unexpected ways. Now if we could just get Warren Buffett to buy a new television.